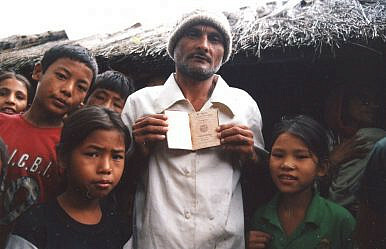 A refugee shows a Bhutanese passport from a refugee camp in Nepal. The mass deportation of Bhutanese-Nepalis in the 1990s remains unresolved 20 years later. Bhutan is often characterized as a land of perpetual happiness, a country where traffic lights are seen as too impersonal and where they measure their country’s output by the famous Gross National Happiness index. Remaining unspoiled by mass tourism and ruled by a popular young monarch, Bhutan is often portrayed as a mythical place, and references to Shangri-La are so overused they have grown repetitive. Bhutan often tops the list of happiest places to live, and is a model of harmony in a hyper-capitalized world. However in the face of all this supposed harmony, Bhutan hides a very dark history. Bhutan is the world’s biggest creator of refugees by per capita. In one fell swoop in the 1990s, the country expelled the Lhotshampa, an ethnic group with its origins in Nepal which made up one-sixth of Bhutan’s population, to preserve its unique national identity. More than 20 years on, thousands still remain in camps in Nepal, lost in their own country. This is at stark contrast with the idyllic and homely image Bhutan has carefully curated for itself. As the world looks on at Syria and the deepening migrant crisis in the Mediterranean and concern grows, Bhutan attracts little attention. But as the world finally wakes up to the plight of refugees, it is important that one of the largest refugee populations in South Asia is not forgotten. While Bhutan expelled “migrant laborers” in the 1990s, to understand the complete picture we have to turn back to the 1600s. Bhutan may claim that the Lhotshampa are newcomers to Bhutan; however, people of Nepalese origin have been in Bhutan since 1620, when Newar craftsmen were commissioned to come to and build a stupa in Bhutan. They have been there ever since. Settling in southern Bhutan, the country’s major food producing region, their numbers flourished and continued to do so for a long period. They gained the name Lhotshampa, which means people from the south. What is more, these were not uninvited or unwelcome intruders. There was a need for foreign labor during this period. Bhutan actively brought this “crisis” on themselves — lacking the manpower for infrastructure projects like the Thimphu-Phuntsholing highway meant importing manpower from India was inevitable. The migration into Bhutan continued, relatively unregulated and without government supervision. It was only in 1990 that border checkpoints and controls were introduced. The expulsion of the Lhotshampas did not happen overnight. Bhutan’s Citizenship Acts of 1958 and 1985 combined to make matters worse for the group. As many Lhotshampa were given citizenship in 1958, that year was the year later given as a “cut off” point. If residents could not supply proof that they were Bhutanese residents before 1958, they were deemed to be illegal immigrants. According to human rights groups, even those who could supply the required proof were often evicted. In 1988 a census was conducted; however, poorly trained census officials made numerous mistakes in administrating the census, as well as stoking up ethnic tensions. Following the census, the Bhutanese government realized the extent of the Bhutanese-Nepali population residing in Bhutan, most notably the Nepali speaking Lhotshampa ethnic group. Ethnic tensions rose and since 1988 over 100,000 Lhotshampa have left Nepal, with many claiming to have been forced out by the Bhutanese government. Many were accused of being illegal aliens and claim they have faced violence and ethnic discrimination. Clashes, sometimes violent, between the Bhutan People’s Party, dominated by the Lhotshampa, and the government are also common. Following the census, the Bhutanese government estimated that 28 percent of the population were of Nepalese origin. However, unofficial claims circled that up to 40 percent of the population was Nepali; this would be considered a majority in the south. This figure soon gained traction in the public imagination. With the events leading up to Sikkim’s joining of India in 1975 still fresh in the minds of Bhutanese leaders, action had to be taken. However with an open border, migrant labor, and the geographical challenges of conducting a census in remote areas, the population numbers quoted may have been way off. Some estimates put the numbers of Nepalese population as little as 15 percent. Further disingenuous tactics were used by the government in attempts to manipulate or distort population levels. According to the report, “The government forced many evicted people, almost all, to sign the voluntary migration form before leaving the country. The local authorities also seized the documents that people have which can prove their Bhutanese nationality, to ensure they cannot produce them again in the future.” These actions have made it incredibly hard for people to return to Bhutan. Discrimination and frankly Kafkaesque rules have been deployed making life considerably more difficult for the Lhotshampa. What is more, the report notes that only it is only “Nepali-speaking people in southern districts who have to produce their documents to prove they were in Bhutan before 1958… Bhutanese from other places are regarded as Bhutan[ese] by [virtue of] their race.” This is a blatantly discriminatory government policy. What relevance do events that took place 20 years ago still have, particularly in the face of a widely heralded and mostly successfully repatriation scheme to the United States and other neutral countries? Even 20 years later, this is not a solved issue. There have been over 100,000 refugees successfully resettled abroad; however thousands remain and there is seemingly little impetus or concern for those left behind. Nepal cracked down and implemented a strict policy regarding Tibetan refugees, in response to Chinese pressure and Beijing’s not unsubstantial monetary contributions. With Bhutan not able or willing to do the same, this issue has dragged on. The lack of a sense of urgency has led refugees to simply languish in camps for 20 years. Currently there are two operational Bhutanese refugee camps in Nepal, down from the original seven. The remaining camps have an estimated population of 18,000. Conditions inside the camps are hard, as they were never meant to be a permanent solution. As this is not a pressing issue for either Nepal and Bhutan, with both sides preferring rehabilitation in neutral third countries, they have been happy to sit back and wait. Bhutan is currently opening up and extending itself onto the world stage, as shown by the visit of the British Prince William in early 2016. With Bhutan starting to take active steps on the world stage, King Jigme Khesar Namgyel Wangchuck should be forced to acknowledge the discrimination and eventual expulsion of thousands of Lhotshampas. The year 2016 is a long way from 1975, and fears of a repeat of the Sikkimese secession to India should no longer be held as a viable threat in Bhutan. As a result, the geopolitical situations that created the paranoia behind the decisions in the 1990s are no longer there; therefore the Lhotshampas should once again be able to live in Bhutan. Finally and most importantly, this is a matter of mutual benefit for both Thimphu and Kathmandu. With Nepal and Bhutan being the two remaining sovereign Himalayan states, they could have a very mutually beneficial partnership in the South Asian Association for Regional Cooperation. They are both nations affected by political, industrial, and social developments in India, and are both at the mercy of Indo-Sino relations. Yet Bhutan-Nepal relations have been a standstill for years. The refugee crisis has effectively put a halt on relations and until this issue is resolved it doesn’t seem likely they will improve anytime soon. Once this issue is dealt with there is no reason that they should not be strong, committed allies. Maximillian Mørch is a post-graduate student living in Kathmandu writing about disaster management, politics, and current affairs.